After their success at Trondheim in 2017, the quartet's 2017-18 season has seen concert engagements across Europe, including performances in the Tivoli Concert Hall Series, the Amsterdam String Quartet Biennale, Stavanger Festival, Trondheim Chamber Music Festival, Schiermonnikoog and Wonderfeel Festivals in the Netherlands, Lammermuir Festival and Music at Paxton in Scotland, and more. Collaborations include working with the Danish String Quartet to perform Octets as well as collaborating on Scottish and Danish folk music, and working on a new commission for clarinet quintet with renowned composer/clarinettist Mark Simpson. The Quartet's debut CD, featuring string quartets by Haydn alongside their own compositions based on Scottish traditional folk music, is due for release in early 2019 on Linn Records. The Quartet is formed of four close friends, who grew up playing folk and classical music together in youth orchestras and music schools across Scotland. The group officially began in 2010 at the Royal Conservatoire of Scotland, where its founding members met as postgraduate students. In 2011, the Maxwell Quartet was selected as the Royal Conservatoire's Young Artists in Residence. The quartet was also named as Residency Artists for Enterprise Music Scotland 2011-2013, which saw several acclaimed concert tours over their two-year tenure. 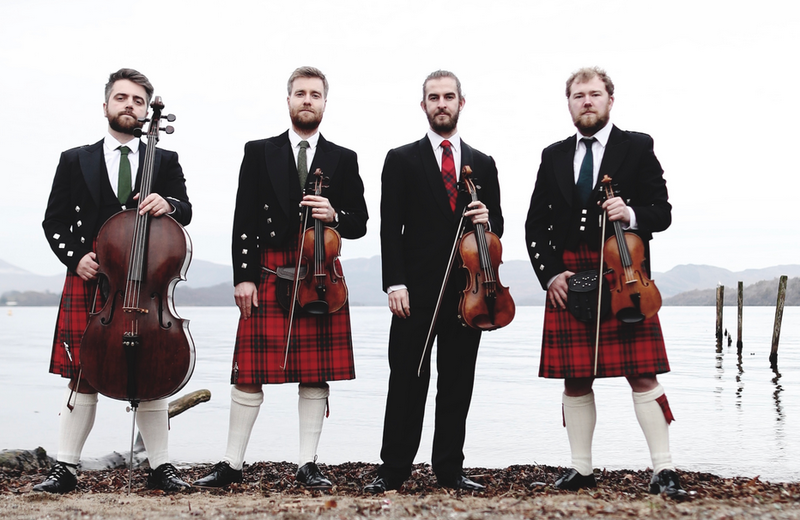 Performing widely across Scotland, the quartet has established a reputation for delighting audiences with their "unnaffected enthusiasm" (North Highland Times) and their "panache and conviction" (Strathearn Herald). The quartet has held residencies at Oxford University, Perth Concert Hall and many chamber music festivals across the UK, including their own festival Loch Shiel in the west highlands of Scotland. Passionate about collaborating with musicians and other artforms, the quartet has worked with a global roster of artists and institutions including Cryptic Theatre, Wintour’s Leap, Royal Ballet School, Lunir, cinematographer Herman Kolgen and many more. The quartet has also worked with some of the UK's most dynamic composers including commissions by Anna Meredith, Tom Harrold, Mark Simpson and Colin Broom. In addition to a busy concert diary, the quartet regularly feature in broadcasts for BBC Radio 3 and BBC Radio Scotland, as well as regularly giving schools workshops and concerts for children. The Maxwell Quartet has studied with the Endellion Quartet through a Chamber Studio mentorship programme at King's Place, and privately with Hatto Beyerle, founding member of the Alban Berg Quartet and director of ECMA in Hannover Germany. Other mentors include Miguel da Silva (Quatuor Ysaye), Erich Hobarth (Quatuor Mosaiques), Krysztof Chorzelski (Belcea Quartet), Donald Grant (Elias) and Alasdair Tait. The quartet plays on very fine instruments generously loaned to them from the Harrison Frank Foundation.